Future Market Insights in its report titled “Industrial Hose Assemblies Market: Global Industry Analysis 2013-2017 and Opportunity Assessment 2018–2028” offers detailed insights and in-depth research on the said market on a global level. The report covers the important factors driving the growth of the market, untapped opportunities for the manufacturers, trends and developments shaping the dynamics of the market and other insights across various key segments. The key strategy adopted by major Industrial Hose Assemblies manufacturers is upgrading their product line with latest features and technologies and also launching new and innovative products to gain market presence and customer base, hence the Industrial Hose Assemblies market is forecasted to improve significantly from 2018 to 2028. The report starts with a market overview along with market definition and synopsis. 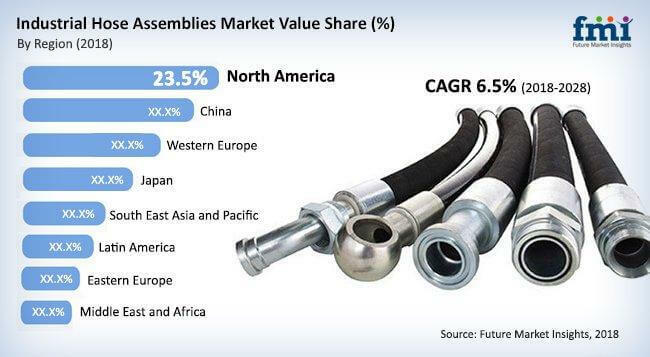 The section that follows, presents the market dynamics which include market drivers, restraints, opportunities and trends in the Global Industrial Hose Assemblies market. The next section of the report provides market share analysis and market attractiveness analysis on the basis of segments such as by material, by product type, by end user and region. It provides a market outlook for 2013–2028 and sets the forecast within the context of the Global Industrial Hose Assemblies market, including the sales volume along with market value and assessment of opportunities in the specified region. The section represent market value and sales volume for each end user of Industrial Hose Assemblies in the specified region or country. The market value of Industrial Hose Assemblies is given in terms of US$ Mn throughout all the segments. Each category within all the segments is clearly described and defined in the research report study in order to help the reader understand the scope and boundaries of the research. The report also offers important drivers as well as roadblocks upsetting the growth of the market throughout the forecast period. Dynamic trends, supply chain movement of Industrial Hose Assemblies end users are taken into consideration and analyzed thoroughly, which is thus incorporated in the research study to equip the client with useful and comprehensive information about the changes taking place in the market leading to inspired decision making for players involved from both the supply and demand side. Other important frameworks such as macroeconomic factors, industrial growth, construction industry outlook, agricultural industry outlook, mining industry outlook, forestry industry outlook, oil & gas industry outlook and forecasting factors are utilized and covered in the report providing the reader with valuable market intelligence and insights. Important statistics such as market share of the company, production volume per year, end user industry data points among others are taken into account for the purpose of gaining an idea regarding the volumetric sales of Industrial Hose Assemblies on a global scale. Secondary sources are referred to cross check with the calculated market volume numbers and the same is confirmed through primary sources from the Industrial Hose Assemblies manufacturers and well known suppliers in order to achieve near perfect volume number. Lastly, indispensable parameters namely market attractive index and impact analysis of both the drivers and restraints across all the eight regions are covered in the study offering insights about the dynamics, growth and untapped potential in the Industrial Hose Assemblies market. Extensive profiling of major players involved in the manufacture of Industrial Hose Assemblies are included in the final chapter of the report detailing the financials, developments, weaknesses and competitive strategies adopted to gain a foothold in the market. 17.8.8. Polyhose India Pvt. Ltd.
17.8.11. RADCOFLEX Australia Pty Ltd.
17.8.15. Abbott Rubber Company, Inc.
17.8.16. 4-STAR Hose & Supply, Inc.
17.8.18. Chamberlin Rubber Company, Inc.